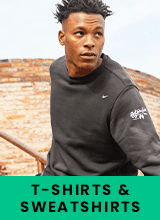 Custom Nike clothing is hugely popular for many reasons: Nike quality is exceptional, Nike's style is unsurpassed, and Nike's Dri-FIT signature moisture wicking technology is both comfortable and practical. 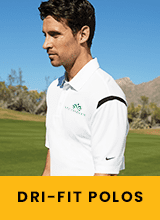 Custom Nike Dri-FITS are a great choice for the office, fieldwork, corporate events, working out, and for competing on the course, the field, and the court. In fact, custom Nike Dri Fit gear is a corporate customer favorite and a sports team customer favorite. Contemporary twists on classic custom Nike clothing makes it the brand favorite for corporate and team apparel year after year. Paired with your corporate or team logo, Custom Nike apparel is an excellent choice for polo shirts, hats, jackets, bags, and more. Our premium quality custom embroidered Nike Apparel or custom screen printed Nike apparel makes your custom Nike apparel choice a win-win for everyone. Custom Nike gear options include custom Nike shirts, custom Nike jackets, corporate and sports team apparel, and bags. Call or text our customer service team today for a quick free quote. One of the best things about ordering from a screen printing or embroidery company like ours is we purchase Nike at wholesale prices and pass that savings along. You'll find some of the same products we offer at your favorite retail store but you can purchase and have them decorated for often cheaper than you can buy those blanks. Add your logo or design to the left chest, upper back or even the sleeve. Our team of professional graphic designers will help turn your logo into a digitized design or something printable. We even have no minimum options available.